Morgan Motor Company introduces a range of ‘110 Anniversary’ models ahead of their 110th anniversary in 2019. 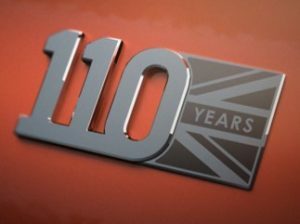 Each ‘110 Anniversary’ model will carry unique celebratory badging, signifying its importance as a 110 edition vehicle 2019 marks 110 years of the Morgan Motor Company, a landmark milestone for the Malvern based company, which remains privately owned by the Morgan family. The ‘110 Anniversary’ models have been introduced in preparation for the anniversary year. Each edition will be available with a specially selected range of options, included at no extra cost to the customer. The current Morgan range includes the 4/4, Plus 4, Roadster and 3 Wheeler. Each of the ‘110 Anniversary’ models benefit from unique badging, denoting their significance as 110th year models, as well as an extensive list of specially selected performance and styling options included at no extra cost. Interior trim and detail enhancements include a leather or wood rimmed Moto-Lita steering wheel, performance seats, a mohair hood pack and any choice of Yarwood leather, also available across Plus 4 and Roadster. In addition, customers will also have the option to have the ‘110 Anniversary’ logo embroidered on their headrest in matching or contrasting stitch-work, further signifying the special nature of their new Morgan. All of these options are available at no extra cost. As well as the Plus 4 and Roadster, the 3 Wheeler also receives a selection of interior and exterior ‘110 Anniversary’ options at no extra cost. For the interior, quilted leather stitching, centre split seats, storage pockets and a mohair tonneau cover are now all included. Regrettably not for USA import.